I’ve lived in Redondo Beach for the past 15 years and here’s what I can tell you. Lifestyle 90% the same as Manhattan Beach or Hermosa Beach at 50-60% of the cost. Sounds good, right? Maybe that’s why over the years Redondo Beach has been recognized as one of the best places to live in southern California. If you are thinking of buying here, it is important to first decide whether you want to live in North or South Redondo Beach. They are both great places to live but there are differences that extend beyond just price. North Redondo (90278) and the more beach adjacent South Redondo (90277). Prices and lifestyle differ between the two. Here’s a fun fact. This stretch of beach front where the bike path starts at the foot of Palos Verdes is known as RAT beach. Some people think that stands for Right After Torrance others say Redondo and Torrance. Your call. Actually, starting in South Redondo Beach you can head north on the Marvin Braude bike trail (the Strand) which starts at the foot of Palos Verdes and continues 22 miles north ending in the Pacific Palisades. It’s a great ride which my wife and I have done many times. South Redondo has a great “downtown” area, Riviera Village, which sits at the foot of the Palos Verdes Peninsula and a few blocks from the ocean. North Redondo is actually landlocked so it is “beach” in name only. Most of North Redondo sits east of Manhattan Beach except for the “Golden Triangle” which is the furthest west RB neighborhood. You can actually walk to the beach from some of the homes. You won’t find ocean views in North Redondo but some homes have mountain views. Because North Redondo has much easier Freeway access - you can be on the 405 in about 10 mins from anywhere in 90278, it has dramatically increased in desirability over the past few years. So while the prices have come up, it is still one of the best values in coastal LA County and that’s even before the Galleria Mall redevelopment. MLS AREA 151 is found north of Artesia between Aviation Blvd and Inglewood Ave. Also known as “Villas North”. MLS Area 152 (aka Villas South) is south of Artesia Blvd stretching more or less to Ripley Ave except for the streets that are in the Golden Hills (Area 154) which is further subdivided into the “Golden Triangle” adjacent to Manhattan and Hermosa. “El Nido” MLS Area 153 is found on both sides of Inglewood Ave and the train tracks. The most eastern homes are actually in Torrance. MLS Area 154 is the “Golden Hills” which is further subdivided into the “Golden Triangle” adjacent to Manhattan and Hermosa. The Hollywood Riviera (Area 128) is the furthest south neighborhood and found at the foot of the Palos Verdes Peninsula. Some of these homes are actually in Torrance with mail going through the RB Post Office. All the properties west of PCH are considered MLS Area 157. This includes properties on the Esplanade. South of Torrance Blvd and east of PCH is Area 156 and north of Torrance Blvd is Area 155. Great schools, jobs, freeway access, weather, beach proximity, restaurants, shopping, movie theaters and more, Redondo Beach has something for everyone. Manhattan Beach is one of the most desirable places to live in coastal Los Angeles County. Homes are also quite expensive even by Southern CA standards. How expensive? Recently 3 Manhattan Beach neighborhoods were ranked in the top 12 most expensive in Los Angeles County. I lived in the Manhattan Beach Sand Section in the 1990’s once on a walk street and another time near Sand Dune park. There are many reasons people want to live in Manhattan Beach such as fine restaurants, shopping and the excellent school system. Mira Costa High School, has been ranked in the top 1% of all high schools nationally. Many professional athletes (Lakers, Kings, and Clippers) as well as celebrity movie stars make their home in Manhattan Beach along with successful entrepreneurs, attorneys, doctors and business owners. There is also easy access to LAX, freeways and that great beachfront. Do you like surfing? Head down to El Porto to catch some great waves. Is beach volleyball your thing? You’ll find everything from starters to world class pros here and remember to check out the Manhattan Beach Open Volleyball Tournament during the summer. Heading east of Sepulveda you’ll find a massive renovation going on at the Manhattan Village mall, more restaurants on Rosecrans and the high end food store Gelson’s now open on PCH. I lived in the Manhattan Beach Sand Section in the 1990’s and really enjoyed it. One time I was on a walk street and another home near Sand Dune park. The Sand Section is the furthest west. This is the strip of land with the walk street homes and the properties on the Strand. There are both single family and attached and detached Towhomes. The Tree Section and the Hill Section are both west of Sepulveda (PCH) and found north and south of Manhattan Beach Blvd respectively. Both neighborhoods are primarily Single Family Residences (SFRs). East of Sepulveda you find Manhattan Village which is a gated master planned community located between Marine Blvd and Rosecrans just east of the shopping area of the same name. The Village has both townhomes and SFRs. The townhomes are zoned as PUD not condo. Also on the Eastside you’ll find the Mira Costa neighborhood to the south and Manhattan Heights / Liberty Village to the north. Remarkably, locals also define two other neighborhoods not delineated in the MLS. They are the “Gaslight District” named after the street lights and the “American Martyrs” neighborhood named after the church. My office at Pier to Pier Brokers is in Hermosa Beach on Pacific Coast Highway (PCH) which is not a highway at all but a surface street with lots of businesses. Also know as Route 1. Hermosa Beach is great for sunbathing, volleyball, surfing, paddle boarding, biking, kayaking, rollerblading, skateboarding and general people watching. Pier Ave is actually one of my favorite blocks in LA. You’ll find mostly local restaurants and bars. If you are coming from PCH, keep heading west (towards the ocean) and you’ll find the Hermosa Pier at the Strand. To get the Hermosa Beach vibe, head down to Pier Ave and the Strand at the foot of the Hermosa Pier. Or if you are on a bike, just make sure that when the light is flashing you walk it near the Pier. You will get a ticket. Really. When the stacks from the AES power plant come down expect to see a major resurgence in this city. 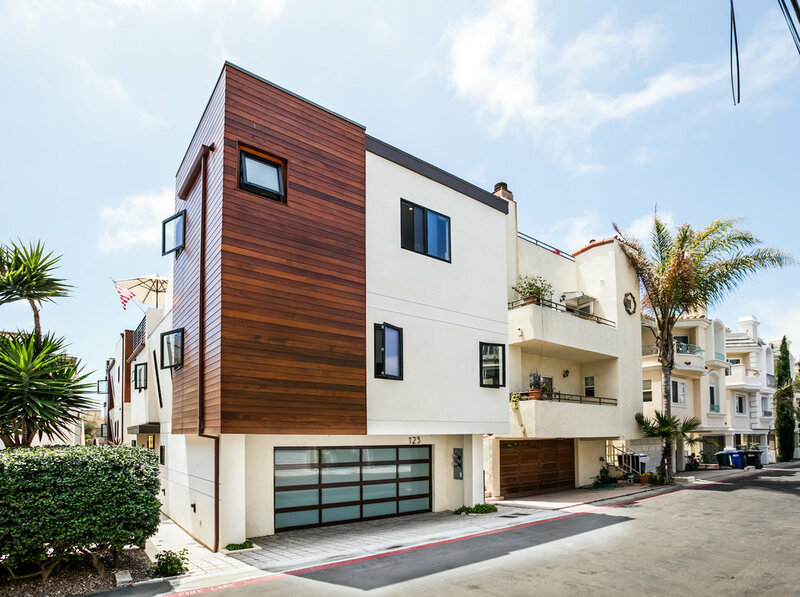 While the beach front homes on the Strand are quite expensive (budget in the multiple millions to buy on the Strand), Hermosa Beach homes are usually priced lower than comparable Manhattan Beach properties. They are, however, often more expensive than Redondo Beach properties of the same size. One thing that’s really cool about Hermosa Beach is that many homes have roof top decks with ocean views. So you don’t have to live on the Strand which are great for entertaining or just taking in the views. Speaking of cool, the Lighthouse on Pier Avenue has been a famous Jazz Club dating back to the 1950’s when many famous musicians made live recordings there. Hermosa Beach has only three defined micro markets. The Sand Section is the furthest west, basically an extension of the Manhattan Beach Sand Section albeit with much fewer walk streets. Hermosa Valley is just east but still west of PCH and you can often buy there at a slight discount. East of PCH is the Hermosa Hills aka East Hermosa Beach. Throughout Hermosa there are SFRs, Townhomes and flat condos. Many years ago I owned a home in Hermosa Beach and loved living there.